Thinking about starting a dropshipping store with Oberlo? Sign up for a free Webinar hosted by Oberlo Customer Success Managers to learn how to get started quickly! There are two different ways you can create an Oberlo account. -If you do not have a Shopify store -> get Oberlo from the Oberlo website. You can also purchase a ready-to-launch Shopify store together with Oberlo. Click HERE and you will be redirected to the Oberlo installation page. Then, click on the "Add app" button and follow the instructions to install Oberlo to your Shopify store. When the installation process is complete, go to your Oberlo account "Profile" settings, add your email address, and set up the password. Do not forget to save changes! If you do not have a Shopify store, you can create a stand-alone Oberlo account from the www.oberlo.com website. Simply click "Get Oberlo Now. It's Free". The stand-alone Oberlo account lets you have a sneak peek of the main features without signing up to Shopify. Also, you will be able to explore the product assortment. 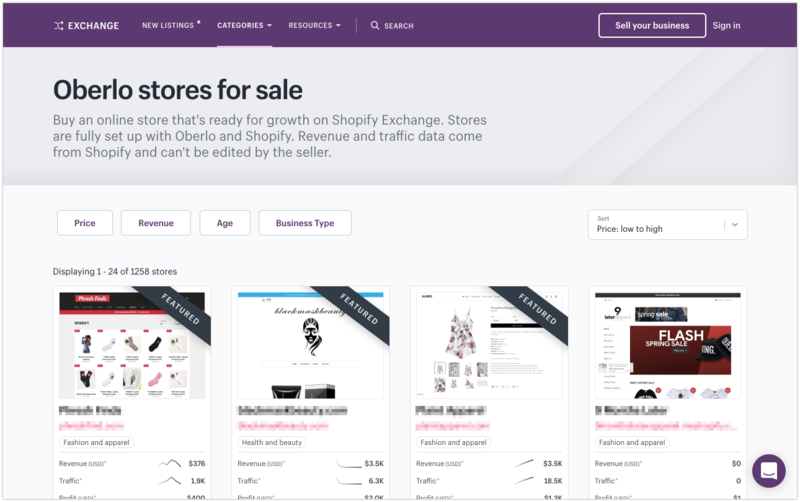 To start selling with Oberlo, you will still need to create and connect a Shopify store. If you do not have a Shopify store and Oberlo, you can explore the pre-made Shopify stores on the Exchange Marketplace. This marketplace is created by the Shopify company, so it is safe to purchase from, and the store data is accurate. Click on the store listing to see the full description, and feel free to contact the owner for more details. Purchasing the fully set-up store with Oberlo from Shopify Exchange can help you save some time, and let you launch your business sooner.